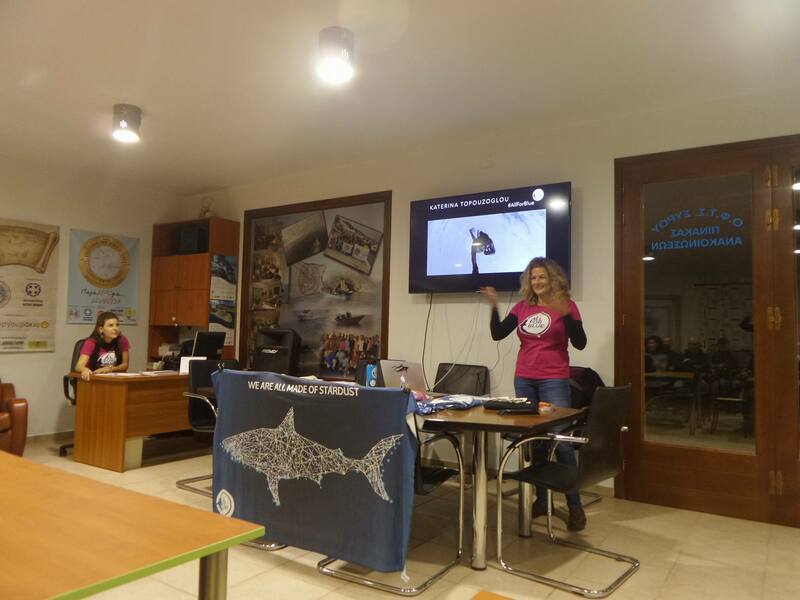 On Monday, November 20, at 7:30 pm, in Syros Island, Greece Mrs. Katerina Topouzoglou, shark biologist and founder of All for Blue, presented her seminar about Ocean Conservation and Shark Awareness. All participants had the opportunity to watch a new view of these misunderstood creatures that are presented as bloodthirsty and dangerous whereas they themselves are recipients of man’s destructive behavior towards nature and the environment in general. The rapporteur has transferred her personal experiences from her contact with sharks and tried to highlight the importance of the work of Beach & Underwater Clean Ups, carried out with the help of volunteers in various parts of Greece and abroad. The participants, who also received certification of attending this seminar from Project Aware, considered the aforementioned presentation quite interesting. We would like to thank Mrs Topouzoglou for the presentation and hope for future partnerships.